Is my tortoise okay? I can’t see it! Is your tortoise giving you a case of the worries because it has dug beyond the wood roof of the burrow or turned a corner and is out of sight? Maybe there has been a lot of rain and you have heard that a sleeping tortoise can drown or a rain-soaked roof can collapse. There are several reasons that you may wonder if the tortoise is okay. Did someone leave the gate barrier down when the gate was open? Tortoises are escape artists. You may need our Snooper Service. The Snooper Service is a highly sophisticated, lighted video camera on the end of a 15′ cable operated by a trained, caring tortoise person. 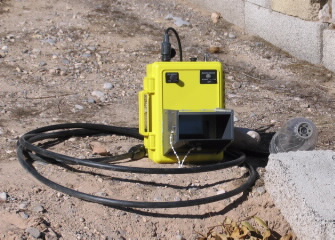 This equipment was developed specifically for peering into burrows and other tight places. 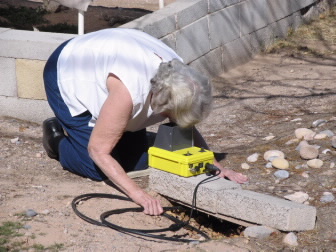 We snake the cable down the burrow and locate your tortoise with the tiny video camera. Call us about your need for assistance. Depending on the time of year, there may be a charge for the service.